LUNDU, Feb 4 ― Election Commission chairman Datuk Seri Mohd Hashim Abdullah today appealed to Tanjong Datu voters not to view the February 18 by-election as inconsequential. Voters should treat the by-election triggered by the death of former chief minister Tan Sri Adenan Satem as seriously as the state election last year, he added. “They should not consider this by-election as less important or that it will not affect the political situation in Sarawak,” he told reporters after the names of the contesting candidates were announced by the returning officer Hamsien Atar at the Lundu community hall. “I hope we can have a turnout of 75 per cent in this by-election, beating the 70 per cent registered in the last state polls,” he said. The by-election will have little implication to the balance of power in Sarawak, which voted overwhelmingly for Barisan Nasional last May and gave the coalition 72 of a possible 82 seats in the state assembly. Hashim also rejected suggestion that the turnout will be low as voters expect BN candidate and Adenan's widow, Puan Sri Jamilah Anu, to easily retain her late husband's seat. The EC chief then said he was pleased with the nomination process, especially outside the nomination centre, where no incidents were reported. “It was orderly and smooth and we hope that this harmonious situation will continue throughout the campaign period,” he said. He said in the state election last year, Tanjung Datu was one of the few constituencies where election offences were reported. Hashim urged parties involved in the campaign to abide by the rules and regulations set by the EC, police and the local authority. “On our part, we have set up an election enforcement unit to ensure that the campaign activities are held within the law,” he said. Jamilah, 61, is facing State Reform Party (STAR) chairman Johnny Aput and native customary rights land activist Raphaelson Richard Hamit of Parti Bansa Dayak Sarawak (PBDS Baru). 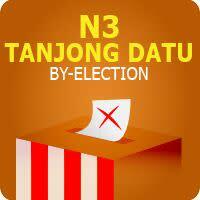 Tanjong Datu has 9,959 registered voters, 53.2 per cent of whom are Malay-Muslims, 18.6 per cent Iban, 17.6 per cent ethnic Chinese, 10.1 per cent Bidayuh, 0.2 per cent Orang Ulu, and 0.3 per cent others. Adenan retained the Tanjong Datu seat in 2016 when he defeated Jazolkipli Numan of PKR by 5,892 votes. He polled 6,360 votes against 468 by Jazolkipli. Adenan had represented Tanjong Datu in 2006, after being the assemblyman for Muara Tuang since 1978.